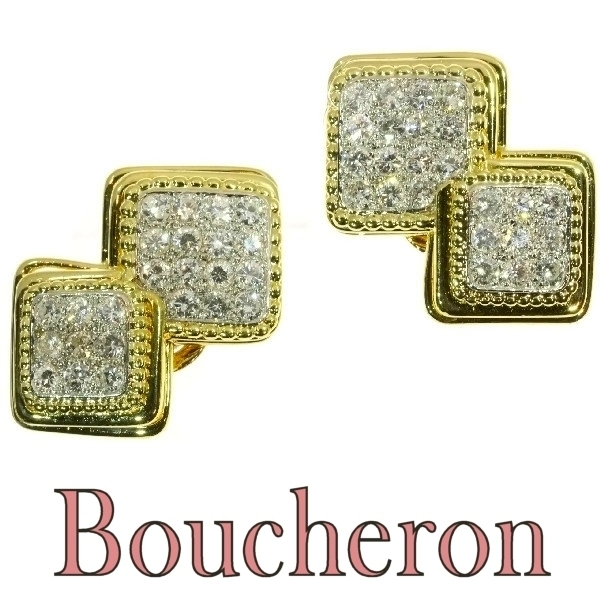 Signed Boucheron Paris estate diamond earclips gold and platinum: Description by Adin Antique Jewelry. In each of these French Boucheron Estate earclips from 1950, two 18K yellow gold squares with 24 brilliant cut diamonds scattered over both fields of platinum merge into one another. A millegrain rim unfolds into a double terrace to enframe the exuberant shimmer of the total of 3.60 carat weight in diamonds. These stunning jewels could be your highlight of experiencing true Parisian Fifties sophistication. Extra information: Boucheron - A leading French jewelry firm, founded in 1858 in the Palais Royal, Paris, by Frédéric Boucheron (1830-1902) and now having its main establishment at 26 Place VendOme, Paris, with branches in London and elsewhere. Frédéric Boucheron was succeeded by his son Louis (1874-1959), in turn succeeded by his son Gerard (b. 1910), whose son Alain (b. 1948) is now active in the business. The London office, established in 1907, is at 180 New Bond St. In 1960 the firm at the request of the Shah of Iran, set up in Tehran the display of the Royal Jewelry Collection. Boucheron is noted as a specialist in gems as well as a designer of luxury and medium-priced jewelry. Diamond(s): 48 brilliant cut diamonds with an estimated weight of ± 3.60ct. (colour and clarity: G/J, vs/si). - All diamond weights, color grades and clarity are approximate since the stones were not removed from their mounts to preserve the integrity of the setting. Total diamond weight: approx. 3.60 crt.